Wow…look at that title. Almost make it into a paragraph 🙂 This dish actually has three different type of meats: Pork, Beef and Chorizo. Chorizo was also something new to me. Well, not exactly new-new. I don’t know if I’ve said it before or not, Food Network is pretty much the only show I watch on TV most of the time ;b and I learned so many different ingredients from there and Chorizo is one of the type of sausages that I’ve heard more and more these days. It’s becoming more common now too in North America. Tinga Poblana is a favorite dish in Puebla, East-Central of Mexico. Tinga Poblana is also used as topping for crispy tostadas. And you probably have already guessed what we ate it with 🙂 hint..hint….start with a R.
This will be the last Mexican dish I cook for now, but don’t be surprised if you see more every now and then. 1. 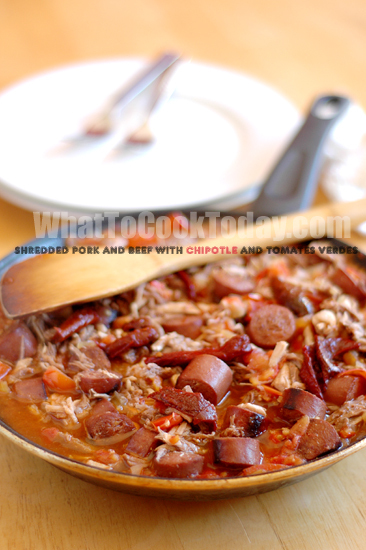 Place the meat in a large pot or Dutch oven and cover with cold water. Bring to a boil over high heat and skim the surface. Lower the heat and add the bay leaves, garlic cloves and 1 tsp salt. 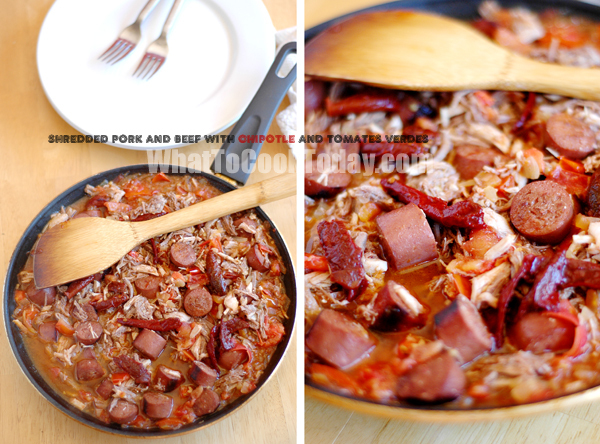 Cover and cook over low heat for 1 hour or until the meat is tender. Let cool in the stock, then drain, reserving the stock. Shred the meat and set aside. NOTE: If you don’t use up the stock, put it in the container and keep it for other use. I find the stock is very flavorful. I used some to cook my daughter’s porridge and rice and she loves it.